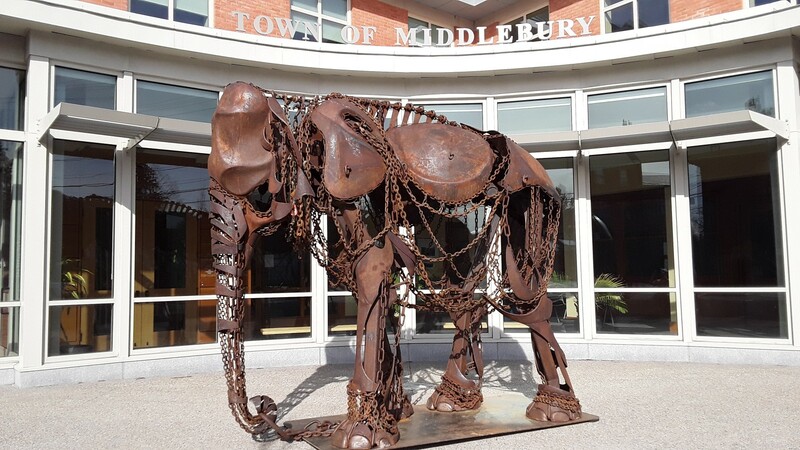 Addison Co. Economic Development Corp.
Home More News Middlebury Has a New Center of Gravity! Middlebury Has a New Center of Gravity! Gravity - all 1,500 magnificent pounds of her - arrived in Middlebury in pieces on Saturday, April 13th. Eben Markowski, Gravity's creator, and a team of assistants began assembling her in the early morning hours and by mid-afternoon she was standing proudly in the center of the plaza in front of the Town Offices. Gravity is on loan to Middlebury for all to enjoy until April 2020.